I've tried a few prints in the last month, but all the large ones warped. I now have some PLA to fix the warping, but haven't tried it yet. 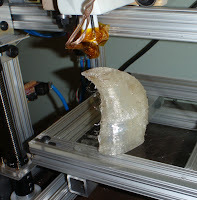 Also, my extruder doesn't push the filiment the way I'd like, and I have to help it along by hand. 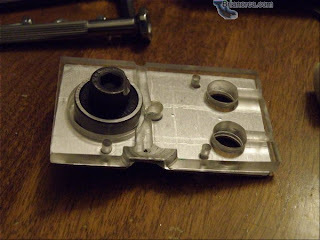 Here's the first half of a new geared extruder which should fix that. Instead of the brass bolt for a barrel, I use a welding tip. It already has a 0.6mm hole at the tip, and it's easy to drill a 3mm or 1/8" hole at the top in a drill press. The smooth outer surface makes for good heat transfer from the nichrome wire. I had several kinds of trouble threading it into the PTFE thermal barrier. First, I used a tap set to thread the PTFE, which created a good thread, but it expanded the hole above the brass, so that the melted plastic would expand too much, and be too wide to pull out, and too thick to push in. For my second try, I cut slots across the threads of a throwaway tip, and used that like a tap. It worked, but the threads were lower quality. 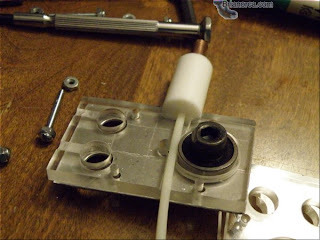 The motor pushed the tip out of the PTFE threads. My third try worked. I use a nut and fender washer to secure the tip. Then I hollowed out the PTFE in the shape of the nut, to keep it centered on the hole. Drill 3 small holes in the fender washer for 1/8" bolts that connect to the acrylic extruder frame. The tip can be easily swapped for another, such as when I had to replace the tape with Kapton. Printed my first object! Still have some fine tuning to do, but it prints. :) It was just a simple cube, but it came out nice. I did have to baby-sit the machine, though. I raised the temperature to 240C, and promptly fried the insulator tape I was using. ("Rescue Tape" is not good above about 220C) I had initially tried "Rescue Tape," a silicon-based tape I found at a local store to keep the nichrome heater from shorting to anything, and it worked well at 200C. But at 240C, it would try to shrink too much, and ended up splitting down the side, exposing the nichrome. So I gave up on that, and ordered some Kapton online, like I should have done initially. Turns out I have a short between a heater wire and the thermisor wire. Didn't test for that. Doh! Well, it grips now. 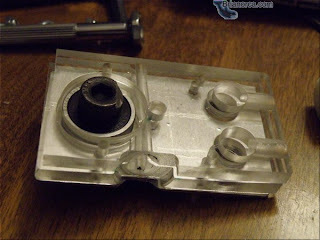 I pushed a bit of rubber between the bearing's post and the acrylic frame, and loosened the nut. Now it grips quite well, and doesn't get stuck on the teeth, like it did when too tight. Only problem is, it pushed the extruder heater barrel right out of the PTFE insulator. So.. on to the next problem. I finally got the extruder to grip the filament. I Dremeled some ratchet steps into the stepper's shaft, and now it will extrude thread out of the nozzle at about 25mm/minute. It can do 40mm/min, but it slips a lot then. 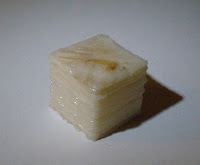 It extrudes, sort of. I can get it to go for a few minutes, but then it stops. I tried making the test part, but when the head stays in one place too long, it starts slipping, and then won't extrude again until I push the filament down for a bit. I'll have to play with the Reprap software settings. It's also slow as molasses. It didn't even finish a layer when I let it run for 4 hours. 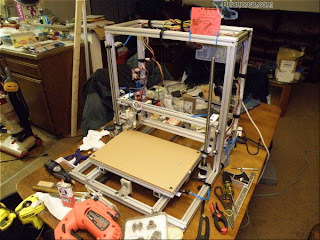 The almost complete RepStrap frame. Rear view of the X carriage. 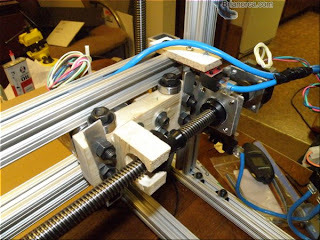 When the thing starts working, perhaps I'll replace all that wood with reprap'ed parts. The blue lines conect to the opto endstops. 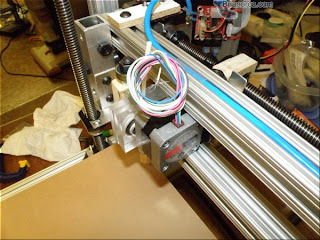 Here is the extruder mounted to the carriage. It's a tight fit, by design, but that may haunt me later on. 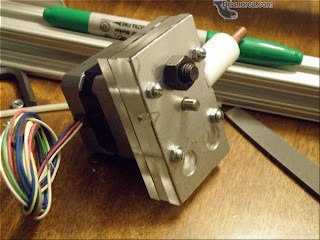 Assembled extruder. 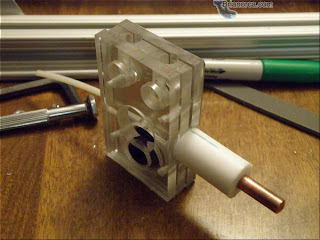 This is my first extruder design. 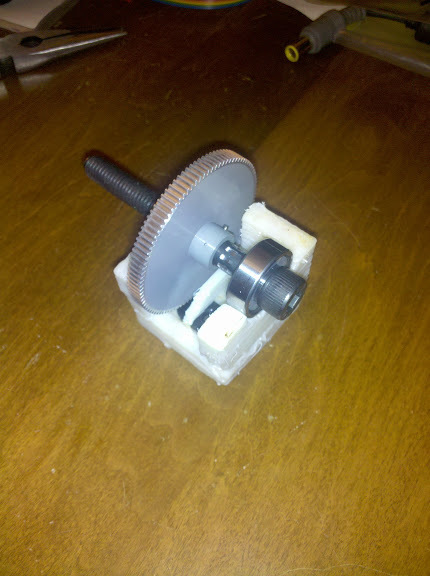 It's pretty much the minimum size for a pinch wheel extruder. This may work against me. Without the motor, you can see the 3 layers of acrylic. The holes at the top of this picture mount the unit to the X-axis carriage. The layer closest to the motor required a larger hole centered on the motor to allow for the raised center of the motor. The other layers have just a small hole for the shaft. The bearing is bolted to an aluminum plate, which, with the motor, sandwiches the acrylic. There is a guide hole for the filament that leads between the bearing and the motor shaft. I have some pictures at my other site. I'll start posting here to share my progress.